We have put together a selection of the top 5 battery powered cordless snow blower reviews. These are very clever machines that are designed to clear snow away at a very rapid rate, and they are easy to use too. If you’re looking to buy a cordless snow blower, you’ll want one that has no limitations on range, can shift snow fast and will last a few years. Lucky for you, there are plenty to choose from. 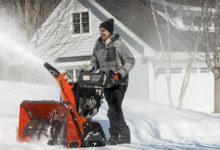 What is a snow blower, how does it work, and why is a cordless electric snow blower your best option? Before we get into our best battery powered snow blower reviews, let’s have a look in more detail about what they do. So What’s The Best Battery Powered Snow Blower For You? A cordless electric snow blower, also known as a battery operated snow blower, is a very handy device to have around the home, and one that we guarantee will make your life a lot easier on those cold and wet winter mornings. These machines do what you do – pick up the snow and throw it somewhere else – but they do it mechanically, so all you need to do is switch on and start clearing. 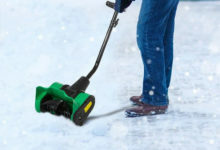 There are many different types of snow blowers on the market; some are petrol powered and for heavy-duty use, there are also electric snow shovels that are smaller and plugin to an electric outlet, and with Lithium Ion batteries making huge strides in technological advancements, there’s now a range of great battery powered snow blowers and cordless snow shovels. What we are looking at in our best battery-operated snow blower reviews are those models that are perfect for domestic use – five of the best cordless snow blower – so that you can find one that will suit your needs and budget. The best cordless snow blowers will be one that fits your budget, is compact and performs the job it is designed for. It will most likely have an adjustable handle, so it is usable by all members of the family, and it will be able to take on a full charge overnight and move a considerable amount of snow before it needs charging again. The mechanical lifting of the snow is performed by a series of blades; some machines can move several hundred pounds of snow a minute, so you will able to clear a considerable area surprisingly quickly. A snow blower is a machine that you need in your toolkit for the winter months, and most are compact and easy to store away when not in use. 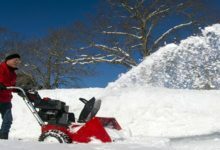 Let’s have a closer look at the top five battery operated snow blower models on the market right now. First on our list is this model, from Earthwise, and it’s a very typical model that comes with many very favorable user reviews. What you want in a cordless snow blower is ease of use, lightweight and capability, and this one offers them all. You get a very compact machine that weighs just 19lbs – that’s not the lightest model but if you want one with this capability you will find they are among the bigger machines – and can clear as much as 300lbs of snow per minute. That’s plenty for a decent area in short time. The clearance width – that is the path that it will clear for you – is 16-inches; this is impressive for a cordless model as most offer somewhat less. Depth is 8-inches, which is also above the norm. It is easy to use and has a brushless motor for lower maintenance, is a push-button start model for even easier use, and throws snow 32-feet for sensible clearance. 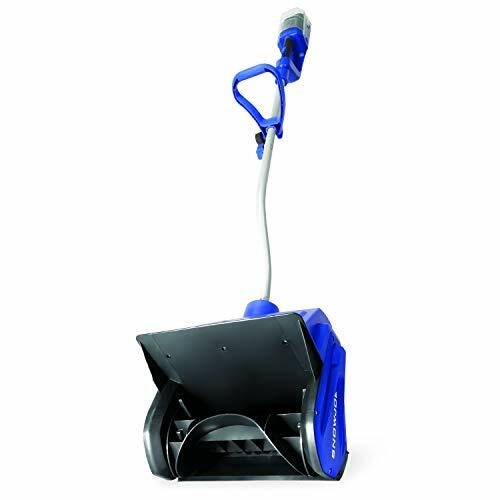 Charge this overnight and you have a machine that will easily clear your drive and paths, and it comes with a fully adjustable handle for added comfort. At a sensible price, we reckon this is one for the shortlist. No cords, oil, or gas needed! The beauty of the cordless snow blower is that unlike those electric models that need a mains output you are not limited in range. Also, in comparison with petrol models, they are lighter and easier to use. This PowerSmart model weighs just over 18lbs so is easy to handle, comes with a full warranty and uses what is the standard 40v battery. This gives you around 25-minutes of run time on a full charge, which should give you enough time to clear a drive or path. It can be fully charged in 70-minutes. The clearance width of this model is a handy 18-inches, but where it really stands out is that it will also clear up to 11-inches depth. That is a very impressive performance for a model of this stature and type. The chute can be handily angled around 180-degrees so you can choose the direction you want to throw the snow, and it can send it up to 30-feet away. With an adjustable handle and a push-button start, this easy to use cordless snow blower is perfect for home use. 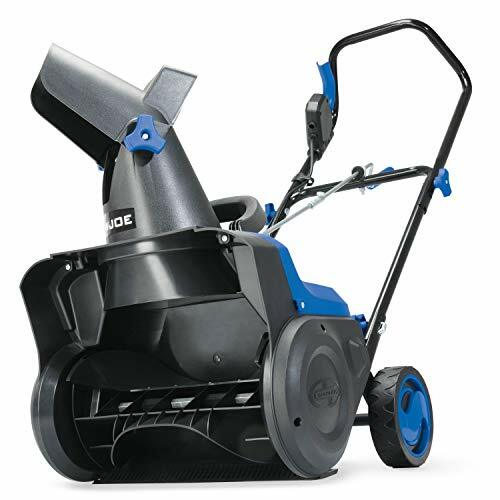 As one of the leading brands in the quality snow blower world, it wouldn’t be a representative list without at least one model from Snow Joe. This one, which offers decent performance for a cordless snow blower, reflects the brand in the fact it is priced somewhat higher than the two above, but it is a quality machine. 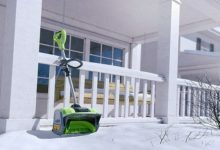 It offers 15-inch clearance width – that means it is not as wide as it’s bigger brother, the Snow Joe iON18SB – and 8-inch depth clearance, which about the norm, and it comes with a fully adjustable handle and can provide enough time for clearing on a full charge. Where this wins, and it is typical of Snow Joe products, is in its clearance rate: you can move as much as 440lbs of snow in one minute with this machine, which is a very impressive result. However, while some can throw snow 30-feet, this model can only send it 20-feet away. That might be a problem for some. The chute is moveable, however, so you can choose your direction. It’s easy to use, with push-button start, and if you want a quality cordless snow blower, this one should certainly be on your shortlist. This one is a heavy-duty model for the home, and if you have a large area to be cleared on a regular basis may just be the model you need. The selling point for this model is that it can clear a colossal 21-inch width path and does so with ease. It is, however, a heavy machine – it is much larger than some of the others – and one that needs some effort to use. It will happily handle 12-inch depths, however, so is perfect if you live in an area with heavy snowfall on a regular basis. You get a fully adjustable handle so all the family can use it, and a handle-operated chute direction control for ease of use. It can throw the snow as far as 35-feet, so you get excellent clearance. 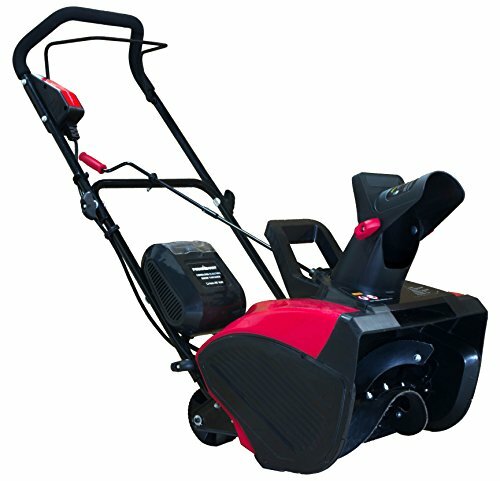 It has a brushless motor for low maintenance and can clear great amounts of snow in a short time. You also get a pair of powerful lights for use in the dark. 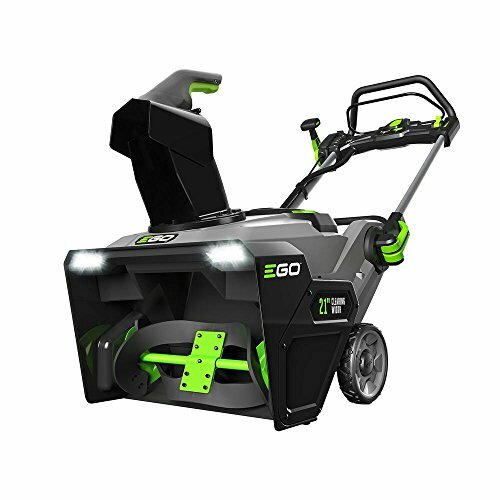 Be aware, however, that the batteries are not included; you need a set of 56-volt lithium ion batteries and a charger before you can use this very powerful snow blower. 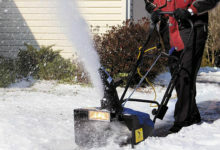 Our final choice is the second one from the Snow Joe brand and is a compact and useable snow thrower for smaller homes. This one is cordless and powered by the usual 40v battery, comes with quick-push button start for ease of use, and is light and easy to handle. It weighs a little more than 14lbs, so is not heavy at all, and comes with the ergonomically designed adjustable handle that the brand is known for. If you’re looking for a heavy-duty cordless battery snow blower this may not be the best choice, but what you get is this; a good quality domestic-use snow blower that will give you a decent 13-inch width clearance, will handle 6-inches deep and will clear 300lbs of snow in a minute. Charge it up overnight, get it out and switch it on and you have a path cleared to get your car out for work in no time, and it stores away without taking up any room. That’s our list of the 5 best cordless electric snow blowers, so which is for you? Let’s recap some of the features you need to consider when you are looking to buy one of these. Clearance rate – how much snow do you need to clear, and how quickly? The models above can clear between 300 and 450lbs of snow a minute, with the lower figure being more than adequate for domestic use. Clearance width – this is the width of the path your battery snow blower will clear for you, and the models featured range between 13-inches and 21-inches. Depth – the heavier the snowfall you experience, the deeper you need your cordless snow blower to clear. The five above vary between 6-inches and 12inches, so choose accordingly. Weight – some of these machines are considerably heavier than others – from around 14lbs to in excess of 25lbs, so make sure you choose one you are happy to handle. Adjustable – you need an adjustable handle so that different people can use it, and all of these offer such. Chute – the chute on some models can be angled for added convenience, and check the distance that it will throw the snow as this can be as little as 20-feet and as much as 35-feet, which can make a large difference. That’s about it for things to look for when choosing a cordless battery snow blower, so which is for you? Let’s have a look! 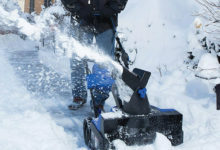 A battery powered snow blower is a great tool to have around when the winter months come, and you will find it is a great investment that really does make those winter mornings more bearable. We’ve covered all the bases with the five above, so which one suits you? 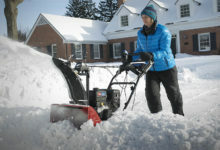 If you live in an area of heavier snowfall, you need a battery snow blower that can move great amounts and we think there are two choices here: the Snow Joe iON 15SB-LT with its amazing 440lbs per minute clearance rate, and the EGO 21-inch Cordless Snow Blower, which offers very impressive width and depth clearance, but is heavy to use and somewhat bulky. If you have moderate snowfall, any of the remaining three will do a great job, but we like the PowerSmart model as it offers excellent clearance width from a lightweight model that is nicely made, compact and easy to use. 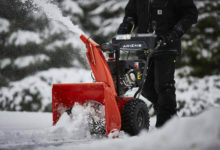 So, we hope our cordless snow blower reviews have helped you find the model that will make clearing away that fresh snowfall much easier on those cold winter mornings. Thanks for the reviews, they were very helpful. We live about an hour north of Denver Co, so the snow can be light and fluffy one time, and the deep and very heavy the next.